CNBC reports that Amazon Web Services and Cerner will announce an agreement this week involving Cerner’s HealtheIntent population health management system, which is already hosted on AWS. The new deal may involve allowing researchers to analyze HealtheIntent data using AI technology. CERN shares led the S&P 500 in gaining 5 percent Wednesday afternoon after the article ran. From Dr. Scripps: “Re: Eric Topol, MD. Has been pushed out of his position as chief academic officer at the Scripps Healthcare System, where he reported to CEO Chris Van Gorder. He still practices cardiology at Scripps Clinic one day a week, but is no longer a member of the executive leadership team. He has joined The Scripps Research Institute (TSRI), which shares the Scripps moniker, but is not part of the health system, which never adopted the ideas Eric has been evangelizing for years.” Eric’s LinkedIn shows that he left the CAO position in August 2017, moving into the role of EVP and professor of molecular medicine at the Research Institute. From A Little BIrdie Told Me: “Re: Iraan General Hospital. They were implementing Athenahealth because of the cost model in the clinics and decided to put it into the acute side. I’m working on what the specific drivers were to go back to CPSI.” Unverified. The trend of CPSI customers going to Athenahealth and then returning quickly to the fold is close to astonishing, although it would be interesting to see what if any inducements CPSI gave them. 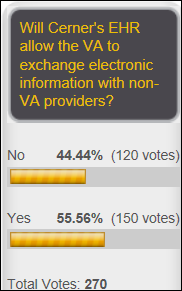 Just over half of poll respondents think the VA’s Cerner system will allow it to exchange information with providers outside the VA. Commenters note, however, that being able to exchange information doesn’t necessarily mean that the VA will actually make it happen. New poll to your right or here: where did you do your online electronics shopping last week, if anywhere? 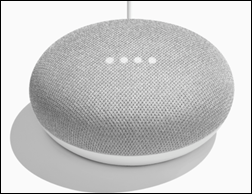 I limited my Black Friday shopping to getting a Google Home Mini and Chromecast to play around with, unable to resist the great deal Google was offering. I was tempted by an $800 Mac Air, but that device is so long in the tooth (especially the display) that it seemed like an unwise investment, especially since I recently paid less for a much better equipped Windows 10 laptop and my only interest was learning Mac stuff and running a couple of Mac-only apps. Actually, I went back Saturday for one more Black Friday weekend special – Amazon-owned Woot! has fantastic deals on Diamondback bicycles (inexpensive, but plenty good for someone like me who hasn’t ridden in years) that beat every price available plus $5 shipping, so the his-and-hers models are on their way. A minimally Spanish-speaking friend is traveling in South America, so I checked out the much-improved, still-free Google Translate app. It can now be used with the mobile device’s microphone both ways – you set the to/from language (like English to Spanish), speak into it (“Where is the nearest bar?”) and it puts the translated text on the screen with an option to play it aloud with a natural-sounding voice for the other person to hear in their language. Then, you flip the languages and let the other person speak in Spanish, which you then see on-screen or hear in English. Google has improve the translation engine a lot, apparently, so it’s more conversational than before. 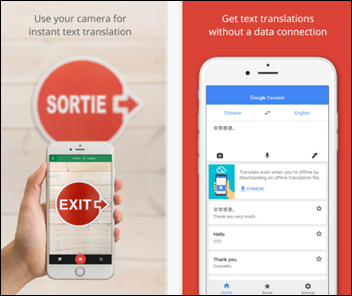 A cool new option (via a Google acquisition) is the ability to translate written words on the screen by pointing the device’s camera at road signs, menus, etc. that then displays the English translation as an image overlay in real time. You can also download the language package so it can be used while offline. President-elect Trump nominates Tom Price, MD as HHS secretary and Seema Verma as CMS administrator. Constellation Software subsidiary Harris acquires IMDsoft. Orion Health shares drop to a post-IPO low following poor quarterly results and its announced post-election US sales concerns. KLAS lists its top radiology PACS innovators as Infinitt, Intelerad, DR Systems, McKesson, Novarad, and Sectra. 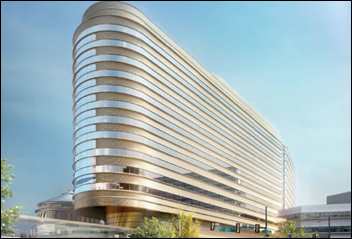 Cleveland Medical Mart signs Cleveland Clinic and GE Healthcare as tenants. OIG warns that CMS is not adequately auditing Meaningful Use attestation submissions, recommending that CMS conduct random audits, issue guidance of the types of documentation it expects providers to have available, and require certified EHRs to issue verification reports. UPMC CIO Mark Hopkins dies of cancer at 47. 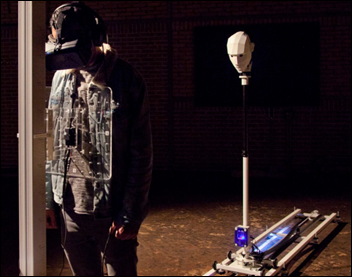 A nursing professor creates simulation training on Second Life. Experts at Penn’s Wharton School predict that personal health records such as Microsoft HealthVault could serve as the bridge between incompatible hospital EHRs. Athenahealth buys a 130,000 square foot office facility in Belfast, ME as its second site. Carestream Health announces plans to integrate its radiology solutions with IBM’s Lotus Sametime messaging. The AMA severs its relationship with Outcome Health following fraud allegations that also caused the company to offer buyouts that were accepted by one-third of its staff. The VA announces that it is considering merging its Choice program with the DoD’s Tricare following discussions about their planned joint EHR. Banner Health confirms that its Tucson-based hospitals are experiencing patient delays following its October 1 Cerner go-live. Advisory Board closes the sale of its healthcare business to Optum. 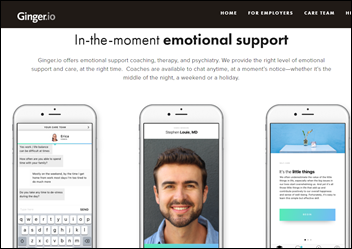 Behavioral app vendor Ginger.io pivots its business to become a technology-focused national medical practice that will provide therapists. The company, which had raised $28 million with its most recent funding round in late 2014, had struggled to get hospital customers in its previous model. Philips acquires Analytical Informatics to enhance its PerformanceBridge Practice imaging department management system. The company offers applications for quality analysis, productivity, dictated report search, scanner utilization, peer review, undictated studies lists, image quality problem reporting, and real-time alerts. 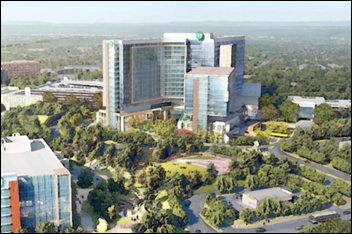 Children’s Healthcare of Atlanta (GA) will spend $1 billion to build a replacement 446-bed hospital on a new campus on North Druid Hills. University of Pennsylvania Health System (PA) will spend $3.9 billion on construction in the next five years, including $1.5 billion for a 17-story patient tower, updating other buildings, and adding a new Center for Health Care Technology that will house IT and other corporate functions. UMass Memorial Medical Center (MA) goes live on Agfa HealthCare’s enterprise imaging platform. Memorial Hospital (IL) goes live on Epic. 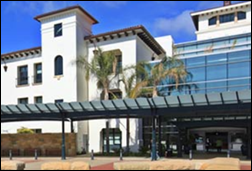 Cottage Hospital (CA) pays $2 million to settle state charges regarding two incidents between 2011 and 2013 in which patient information was freely discoverable in Internet searches. The hospital, which faced up to $275 million in penalties, has agreed to upgrade its security infrastructure and to hire a chief privacy officer. Researchers find that only 21 percent of Florida physicians have registered for the state’s prescription drug monitoring program database, with lack of EHR integration being found as one significant factor. Use of the database to check patient opiate histories is voluntary, but submission of opiate prescription and dispensing data is mandatory. The fear and experience of death is a neglected topic. If we began treating our anxieties surrounding death, it might mean the process of dying could become more comfortable. In the developed world, the majority of people die in hospital or a care home, turning deaths into medical experiences. But doctors are trained to save and prolong lives, not tend to our demise. They simply lack the tools. China, following through on its ambition to lead the world in AI by 2030, announces plans to build an unmanned, AI-powered police station that can handle DMV-type issues such as administering driver exams and vehicle registration. 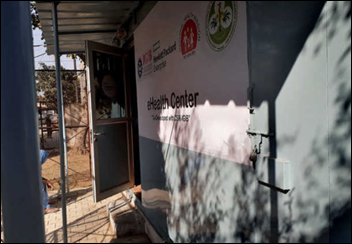 I wrote last week about the dedication of a new e-health center in India that admitted afterward that it had no actual doctors or staff, with outside workers brought in for the ceremony as pretend employees to impress the locals and the governor of Punjab. The center has closed four days after it opened after the lone doctor at the dispensary where it was housed “was found missing” (is that an oxymoron?) and even the dispensary itself has closed until a replacement is found. Cerner seems to be following everything Epic does step for step. Epic got 5 minutes of air time at the Microsoft conference for doing the exact same thing. Epic has also hosted non production systems on Amazon and Azure but customers get concerned about lax BAAs and small limits of liabilities by the cloud providers when it comes to patient data. Will be interesting to see the Terms and Conditions afforded to healthcare organizations who allow their patient data to be used in the cloud by others. Doc, love the blog. But your neutrality is starting to wane. Seems like you have a vendetta against athena? Is it bc they aren’t a sponsor but have plenty of money? Don’t get me wrong not a fan of them but I am a fan of neutral reporting. So you’re on record with facts disputing those CPSI press release that quote former Athena customers that went back to CPSI? Nice to see a reasonable comment marred with dislikes. Hard to imagine any coverage or “impartial” “readership” exists here. Athena has gotten plenty of glowing press coverage for more than a decade, much of which was reported on HISTalk. If someone reports and HISTalk confirms a de-install, it is not bias for it to be reported. Given Athena’s proclamations, it is significant if any hospital, especially small ones, sign to replace their HIS with Athena and then go back. Of course they got some inducement, but if the Athena HIS is so great no one would leave. I would venture to say it’s a bit more complicated than “if the HIS is so great no one would leave.” There are lots of considerations and nuance that goes into HIS selections, and we all know there are gaps, deficiencies, and bugs in every vendor’s product. I’m sure there are plenty of flaws in Athena’s system, and plenty of flaws in CPSI’s. What I find interesting is the sudden flurry of these press releases from CPSI. Do you think they’re feeling pressure from all the “big” vendors suddenly encroaching on their market? According to Klas, Epic, Cerner and Athenahealth are the only ones to really gain any hospital market share over the last two years, and now Epic and Meditech have announced solutions specifically aimed at the critical access market. In the sub-50 bed market, those gains have to be coming from somewhere, and I’m guessing it’s CPSI/Healthland. Mr. H has not shown bias in any direction in the 5+ years that I have been reading the blog. In some cases, his facts have not been 100% accurate based on his not having some non-public information but I have never seen a bias, including when he has called out issues with a vendor which I often am biased in favor of. using language such as “trend..” and “returning quickly” and “astonishing” offer a glimpse into your view and encourages readers to follow you. Is it a trend? How many have signed with athena? If 150 had signed and, what is it now, 6 or 7, returned that hardly seems like a trend. “Returning quickly”: Have they gone through the implementation process? How long have they been live on athena? “astonishing”: I’m more interested. Interested in why they left? What things did they feel didn’t work? What was/is the transition like? I’m very interested in learning about the CPSI inducements and concessions as having switched several systems myself I know it’s no easy feat. I think the most interesting aspect of these CPSI announcements isn’t the percentage of former CPSI customers who return (which clearly is a trend), or the number of ATHN customers that walk away in moving to any other vendor. Any deinstallation is pretty big news, suggesting that the client was misled, mismanaged the implementation, or were offered some form of incentive or found other benefit worth going through all that work again. It’s even bigger news when that client returns to their old vendor’s system, an event almost unheard of in HIT-land since if you disliked the product and company enough to leave, it’s not likely you’ll change your mind and bring them back in. Some of those changes were probably due to acquisition or management changes (like the hospital that was featured in a glowing Athenahealth press release and then decided to change back to CPSI just a few weeks later), but there’s probably an undisclosed theme in play. Imagine if a handful of Cerner sites converted to Epic, then announced their intention to switch back — that would be a trend worth investigating given the headaches involved in switching systems twice in a relatively short term. 1. Is Athenahealth really moving toward becoming a significant inpatient vendor, or did they underestimate the work required and will have to either spend more or scale back as their activist investor pulls the strings and “core business” beckons as it always does with publicly traded companies? They spent what I assume was a significant amount to buy RazorInsights and BIDMC’s WebOMR and rewrite them into a single product, but it’s not obvious which products the back-to-CPSI customers found problematic or why. 2. Does the subscription model encourage customers of any vendor to bail more impulsively since they don’t have a capital investment at stake? 3. We’ve all enjoyed Jonathan Bush’s jabs while nipping at the heels of behemoths like Epic or Cerner in labeling them as dinosaurs, so it seems kind of beneath the company to be battling over 20-bed hospitals with (boringly) publicly traded CPSI, whose valuation is about 1/12 that of Athenahealth and whose share price trend is awful in comparison. The primary attraction for smaller hospitals to go to Athena Health is the subscription model. You get a modern EHR from a successful company without a huge upfront cost? From a company that already has shown you some proven results as far as improving collections for outpatient providers? It makes perfect sense because cash flow is everything when margins are so small. From a non EHR industry savvy executive perspective it seems like a smart and safe decision. Certainly lower risk. It worked very well in the practices and clinics so it would follow that Athena can get the job done on the inpatient side with a more modern EHR system. It all sounds great but the battlefield of EHR systems is littered with best of breed carcasses. “IGH (Iraan General) made the decision to transition back to Evident for the Thrive EHR system based on several factors. 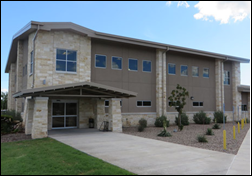 When they initially moved away from Thrive, they thought they were getting a hospital system that would have the same functionality they had with Thrive while integrating with their existing clinic system. But after making the switch, they encountered hospital billing issues and were never able to fully convert to the new system because it was unable to handle all of their service lines. It appears pretty obvious the issues lie in marrying up disparate systems written by different developers with different paradigms and different databases. As well as Athena not being able develop the code to fill in service line gaps fast enough and the always tricky navigation of interfacing. It is going to be interesting to watch Allscripts/McKesson navigate similar waters over the next 18-36 months merging systems and bridging development gaps to deal with MIPS, MACRA, and population health strategies. One has to wonder if the issues Revenue Cycle issues Cerner is having is rooted in navigating the Siemens acquisition and various other less publicized additions they have made over the years to create a broader on the surface platform. There’s rarely any bias here on HISTalk, just facts. If anyone wants to see how Athena customers are doing one just needs to check out their most recent Facebook reviews. Spoiler alert: they aren’t amazing.